The op-ed writer Dickson Despommier notes that he’s in the business of building vertical farms and insists they “would not only revolutionize and improve urban life but also revitalize land that was damaged by traditional farming. 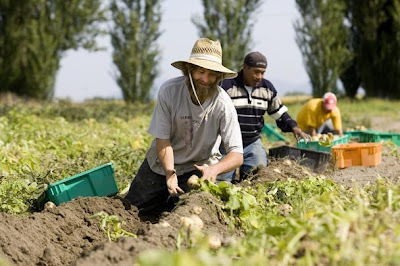 For every indoor acre farmed, some 10 to 20 outdoor acres of farmland could be allowed to return to their original ecological state (mostly hardwood forest).” His was an interesting read, with much food for thought, and I encourage you to read what he has to say in its entirety — because from the sound of it it’s not just pie in the sky. Meanwhile, may I suggest a drive out to the Skagit, where you can get a taste of the many splendors the verdant valley has on offer at farms, farmers markets, roadside stands and U-Pick Farms along the way — so long as you know where to look (like, right here on this downloadable Skagit Valley 2009 Farm Map & Guide). P.S. a few bucks buys a giant ice cream cone at Snow Goose Produce on Fir Island (my kid’s favorite stop). 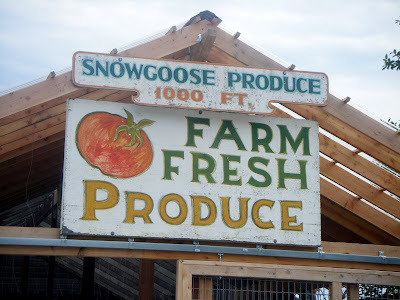 Think globally, eat locally: Snow Goose sells ice cream, Skagit Valley produce and much more. I’ll be heading out to the Skagit next Sunday, August 30, where you’ll find me joining hosts George and Eiko Vojkovitch and their daughter Nicole at Skagit River Ranch. There, I’ll help judge the “Perfect Burger Cook-off” at Skagit River Ranch Farm Day. 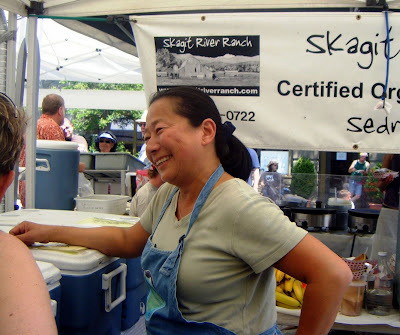 Skagit rancher Eiko Vojkovitch sells her sustainably raised meats at area farmers markets. The cook-off pits chefs Greg Atkinson, Maria Hines and Craig Hetherington against one another, and is sure to make good use of the ranch’s certified organic grass-fed beef. There will be burgers and sausages for you, too (food is included in the ticket price: $30 per person, kids 12 and under free) as well as a farm tour, petting zoo, live music and other family-friendly activities. For details and ticket info click here.